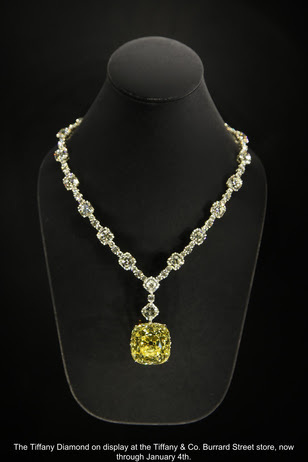 WHAT: The Tiffany Diamond, one of thelargest and finest fancy yellow diamonds in the world, has traveled to Canada forthe first time in its history. The TiffanyDiamond is on public display at the newly renovated Tiffany Burrard Street store to honor Tiffany’s 10th anniversary inVancouver and in further recognition of Canada’s 150th anniversary. The TiffanyDiamond’s permanent home is at theTiffany flagship store on Fifth Avenue inNew York. While travel is rare, the TiffanyDiamond has visited Paris, Beijing, Dubai and now Vancouver. The Tiffany Diamondhas become a symbol of the highest standards of quality and craftsmanship established with the founding of Tiffany in1837. The stone’s acquisition solidified Charles Lewis Tiffany’s reputation as the“King of Diamonds” and made Tiffany theworld’s diamond authority. The TiffanyDiamond is displayed in a magnificent necklace of dazzling white diamonds, totalling over 100 carats and featuring 20 Lucida® diamonds. The necklace was crafted in 2012 to celebrate Tiffany’s 175th anniversary and is only the fourth setting the diamond has seen in its 140 year history. Tiffany & Co. Founded in New York in 1837, Tiffany & Co. is the world’s premier jeweller and America’s house of design. An iconic brand with a rich and storied heritage, Tiffany is a global manufacturer and retailer of jewelry and luxury accessories. The company operates more than 300 TIFFANY & CO. stores in more than 20 countries. Please visit us at Tiffany.com.